There is no need for us to be put off by the provocative prefix anti-, which so often creates diverse antitheses, most recently that of anti-painting. Let us start with the fact that the artist’s christian name is Antonin, and he signs his pictures ANTI. If he is thus genetically predetermined, then there arises the question as to whether it is „anti-“ or „ante-“ in his pictures. Leaving complex anticipation aside, to my mind what best fits the predetermined nature or translation of Antonín’s nameis the notion of the antiphony, which is a clear sung response, or put better an alternating song which always rings out from two places in a church. Either a choir responds to a solo in a „respondarium“, or two choirs reply to each other. What is the basis of the antiphony of Antonin Kaspar’s work? 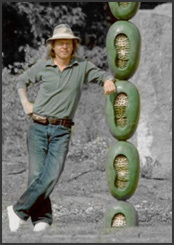 Originally trained as an artistic blacksmith, he worked for a long time with metal sculpture. In his realisations for architectural projects he also used steel, bronze and stone. However iron remained his basic stimulus, since it requires very particular working. It must be worked while it is still red-hot, in the same way that the glassworker must rapidly work another material. The more demanding an artistic concept is, the more complex the concrete act of production. It is a kind of time and performance art. Out of this long period of work there emerged rough figural sculptures in metal, often very aggressive with points and spikes precisely for this brevity of stopping in the course of philosophical meditation. There emerged the need to create a counter-balance; not to be manipulated or defined by his work timewise, not to be bound to a finite working of the material leaving only individual originals in his tracks and not to be limited by dirty and noisy surroundings of the forge. This led necessarily to the antiphony of white. In relief canvases and sculptural graphics piling up the substance and effects of white, a responsibility for the white picture arose through progressively technological alchemy, a responsibility which in the ridding of colour is the most difficult. There emerged almost amorphic canvases in an attempt to provide people with a feeling of tranquility poise, purity and playfulness in the working out of hidden meanings. These pictures are no longer spiked, assaulting our consciousness, but bring well-being and beauty, and everyone takes something of this away with them according to the strength of their imagination and the depth of their reflection. It is an atmosphere almost that of oriental aesthetics, containing hidden meanings of open solutions. Understandably, white paint on white is nonsensical. Malevich once called it the dimension of absolute sensitivity, while Fontana wanted to objectivize it by cutting up areas of white canvas. Manzoni wanted to negate it in his „achromes“ with the help of the „infinite lines“ of enduring drawing expression, where concrete space was mostly created by crumpling the canvas as a material. Therefore in Asia white is called emptiness, which becomes visible either by the use of contrasting black or by the general use of contradicting forms, asymmetry or material. In Antonin Kaspar’s work, however, white appears in a whole range of tones. He faces the great self-discipline of staying in the reality of white, not settled in the transcendental but remaining in reality. 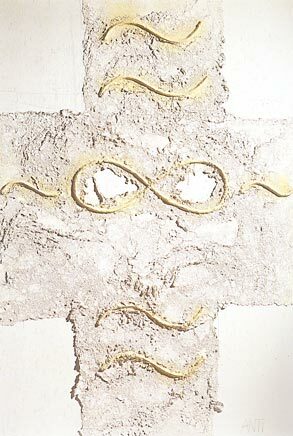 The plasteline which forms its logograms with relief modeling is covered with paint, but this paint contains beeswax, so grease seeps out or the paint peels. 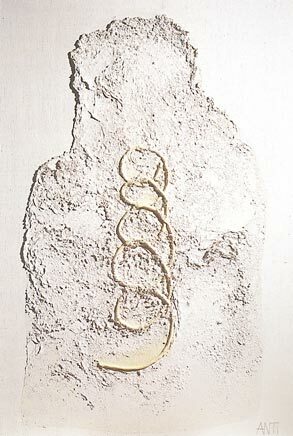 The alchemy of white oil paint on the background also requires cement, and thus differs from simple white, creating yet another basic background to the layered formation. 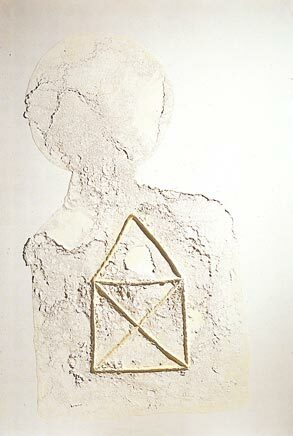 The whole is scattered with plaster-of-paris, under which the picture rests for several days, leaving the surface to develop into a textural, material surface. Nevertheless the drawing from the first painting plan often shows through. It does not seem, however that this bothers the artist in any way. He would like to keep his experimentation under the control of his aims, and differentiate the individual layers according to their meanings. In the contrast to metal which quickly solidifies, the gradual crystallizing texture of paint is often a desirable surprise. 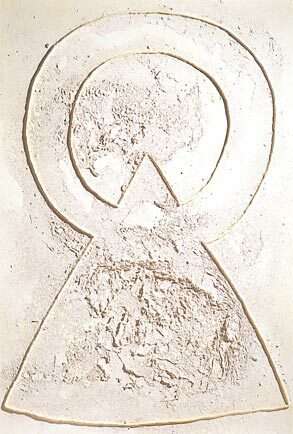 Figural logograms which appear in the white paint are drawn from Kaspar’s first experiences during his period of figural metal sculpture. Altogether they create a background, and only occasionally does their contour fuse with the inner life of the figure. In most cases, they are the figure or objects which the figure is thinking about, the kind of expression of the basic disposition of human feelings or thoughts where the individual motions of the mind, life, energy association or anything which needs to be reflected on. 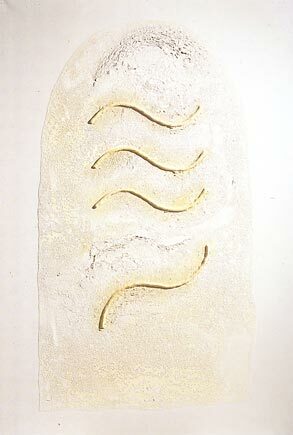 They emerge as a relief-formed oval or straight, simple line. Sometimes such mental-psychic motion occurs along a spiral, issuing forth for instance in a square. Sometimes it is enclosed in various titled triangles. Occasionally on the background there is even a non-figural motif such as an oval or egg, and in it a linear maze or ladder. The work as a whole is undoubtedly clearly arranged, though has many meanings. On one of the backgrounds, the artist’s young son thought up a „hand-foot“ or a little house which he wants to build one day. 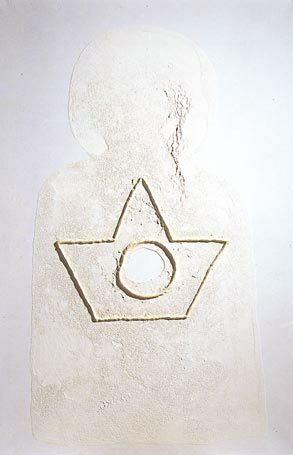 On another, a small child in the form of a cross., spread out like the Phoenix, grows out of a white womb. The logograms of Antonin Kaspar follow on from his earlier graphic experiments, pressed into plastic white foil like a kind of molded print, adorned with „bird lettering“. This is imaginary lettering, of course attended by our archetypal experiment with lettering in pictures, whether Chinese signs or the string lettering of primitive African tribes. In any case, it is a matter of pre-civilization pictography, later also transposed into architectonic forms. This primary experience defines the mood of the pictures, which is additionally formed by the way light falls on them in their installation. The way the works are illuminated also changes how we harmonize with the whiteness, from prosaic experiences through to mystic ones. It must be pointed out that the artist is used to listening to music while creating his work, and that he deeply admires Tapies and Miró, though in his own sensibility he is thoroughly contemporary. The antiphony of whites in white, its figural-abstract morphology of chosen sign at the pitch of seriousness and humor emotiveness and reflection, the expression of a certain general nostalgia towards the nature of history – all this points us towards the consciousness of co-creation. Kaspar’s pictures also express well the conceptual contradictions between the prefixes „ante-“ and „anti-“ themselves, in the way that it is anticipated as questioning, a point of issue and the way that painting exists today.